Brazilian Institute of Architects / Rio de Janeiro is hosting a Parametric Design and Digital Solution Workshop in Rio de Janeiro, Brazil! Students will work with digital tools such as Rhino and Grasshopper. The workshop allows participants to experience the process of systematization through practical and theoretical classes. The course is 16 hours total, divided into 2 classes of 8 hours. The program addresses surface construction, Euclidean transformations, Cartesian and Parametric space, Boolean and mathematical operations, construction and division of surfaces, patterns, constraints system, data tree, attractors, and repulsors. 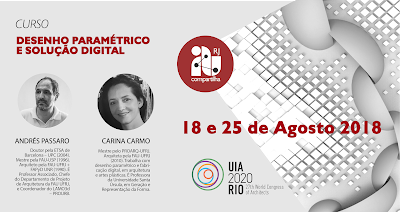 For more information please contact Carina Carmo.